At BinaryNow our commitment is to deliver you only the best. If you can find a better deal on SoftMaker Office 2018, we will match it! 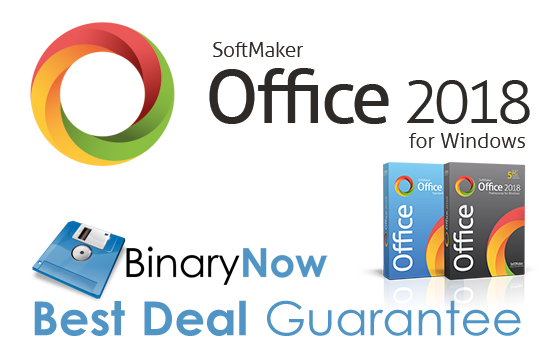 BinaryNow will match any legitimate offer from another reseller or even SoftMaker Software GmbH itself. We can save you some time…. because a better deal just doesn’t exist! There is no need for a special coupon code or waiting for future promotions, our e-store one-click purchase pricing is the best deal on the market today. It gets even better. Our upgrade prices are not only $10 lower than MSRP, but they also cover wide range of the products. So if you use(d) any of these products: SoftMaker Office, Kingsoft Office, BinaryNow Office, Encore Office Suite or 602PC SUITE you qualify for upgrade prices. BinaryNow is an official SoftMaker distributor in North America. By purchasing your license directly from us you gain not only a better price and our support, but also direct technical support from SoftMaker Software GmbH itself. Your license key and download will be provided to you instantly. If you are interested in corporate license or have a need for more than 50 licenses, or found a better deal and want us to match it, contact us by completing this form.